We must RETHINK the way trash is managed. LCSWMA views waste as resource for sustainable, green power. In fact, every day, we transform trash into renewable energy (electricity) that powers tens of thousands of homes and businesses. And we also seek to use waste in new and creative ways to help our community be more sustainable. Read on to learn more about our various green energy projects. 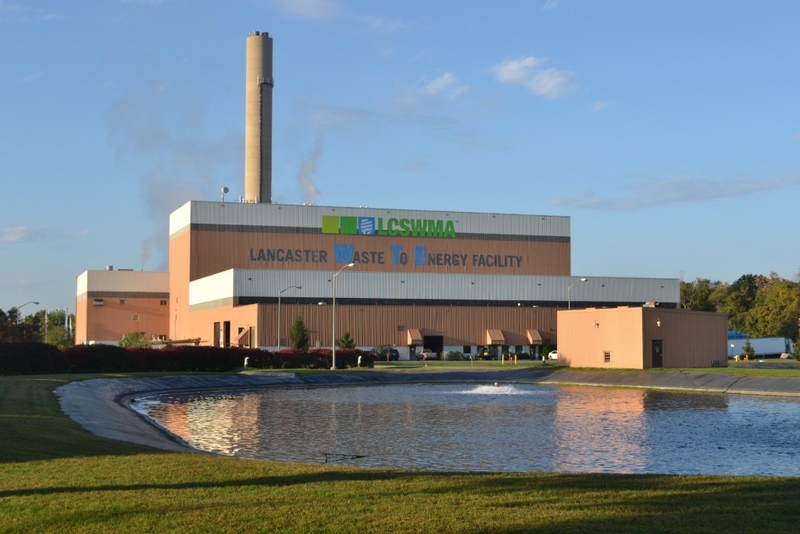 LCSWMA owns the Lancaster Waste-to-Energy (WTE) Facility in Bainbridge and the Susquehanna Resource Management Complex (SRMC) in Harrisburg. LCSWMA contracts with Covanta Energy to operate both facilities. The WTE process generates renewable energy through a mass burn combustion system, which means there is no separation of the material at the facility. The waste burns at high enough temperatures to convert water into steam that drives a turbine to create electricity. A very small portion (about 10%) of the energy generated at each facility is used for site operations, while the majority (about 90%) is sold for revenue. The WTE process reduces the volume of waste by 90%, so significantly less material is landfilled. The WTE process reduces greenhouse gas emissions by combusting the waste, instead of landfilling the material. Ferrous and non-ferrous metals are recovered from WTE ash and recycled. In 2018, LCSWMA integrated our Lancaster WTE Facility with Perdue AgriBusiness’s state-of-the-art soybean processing facility. Through a 20-year agreement, LCSWMA provides around 15-20% of WTE steam to Perdue for drying and processing operations at their facility. This negates the need for Perdue to burn fossil fuels in these processes, thus significantly reducing greenhouse gas emissions. 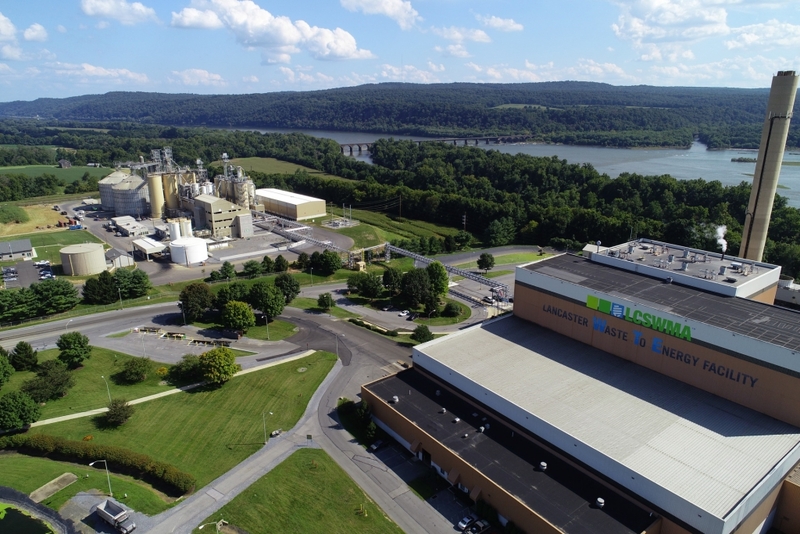 Additionally, Perdue uses process water from the Lancaster WTE Facility, which is then returned to LCSWMA for treatment in our closed loop, zero discharge system. This project exemplifies sustainable, synergistic public-private partnerships, and is bringing significant benefits to our local agricultural community. Lancaster WTE Facility provides 15-20% of WTE steam to Perdue. This project reduces environmental footprint of the Perdue facility by reduing the reliance upon fossil fuels. LCSWMA provides up to 47 million gallons of water per year, intead of using water from the Susquehanna River. 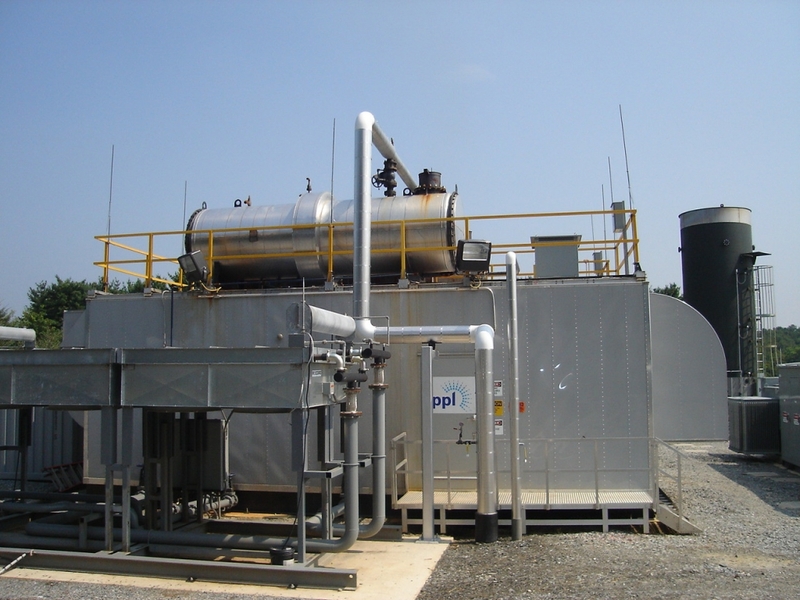 The Landfill Gas (LFG) Plant converts methane gas emitted from landfill waste into renewable energy. Gas from our closed Creswell Landfill and active Frey Farm Landfill is sold to Energy Power Partners who owns, operates and maintains the plant. During the natural progression of bacterial decomposition, landfill waste emits methane gas, which is collected through a series of pipes. Major particulates and water are removed and the clean gas is burned. The LFG Plant has a 1.6 megawatt capacity, which is enough renewable energy to power the equivalent of 1,200 area homes. In addition to the benefits of generating renewable energy and preventing methane gas from polluting the air, the LFG Plant provides Turkey Hill Dairy, a neighboring manufacturing facility, with a green power source. Steam produced as a by-product of the combustion process is piped to Turkey Hill Dairy where they use the steam to sanitize food processing equipment, instead of using commercial boilers. This offsets more than 140,000 gallons of diesel fuel annually. The LFG Plant has a 1.6 megawatt capacity. The LFG Plant powers the equivalent of 1,200 area homes. LFG steam is used by Turkey Hill Dairy in their processing equipment, which saves 140,000 gallons of diesel fuel annually. In 2010, the first commercial-scale wind project in south-central Pennsylvania was installed at Frey Farm Landfill. This 3.2-megawatt wind project is located on a non-operational portion of the landfill. Two General Electric turbines, overlooking the Susquehanna River, directly confront prevailing winds from the northwest. The electricity generated by this project is sent by underground lines to neighboring Turkey Hill Dairy, where it is used to power their manufacturing operations. In fact, 21-25% of their annual electric needs are fulfilled using wind energy from this project. Collectively, the two wind turbines generate about 6-7 million kilowatt hours of electricity each year. That is enough power to make about 5-6 million gallons of ice cream. 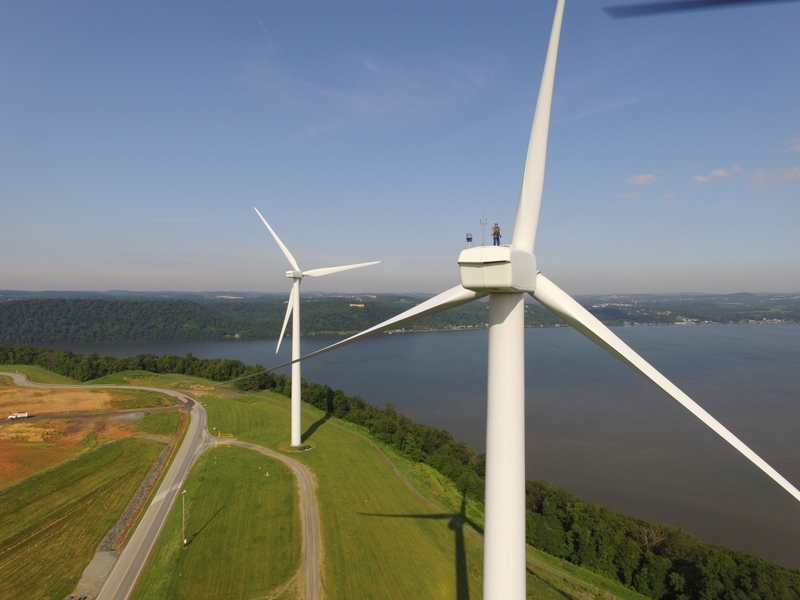 First commercial-scale wind energy project in Southcentral Pennsylvania. Generates 6-7 million kWh of electricity annually for Turkey Hill Dairy. Generates enough energy to power to make 5-6 million gallons of ice cream. Over 2,000 solar panels on top of the Transfer Building, Small Vehicle Drop-Off Building, Household Hazardous Waste Facility and Maintenance Building at the Transfer Station Complex in Lancaster generate renewable energy from the sun. Solar radiation is captured by photovoltaic cells in the panels that convert the sun’s energy into functional electricity used to power the complex. In fact, this project produces enough electricity to offset 80% of annual electric usage at the site. 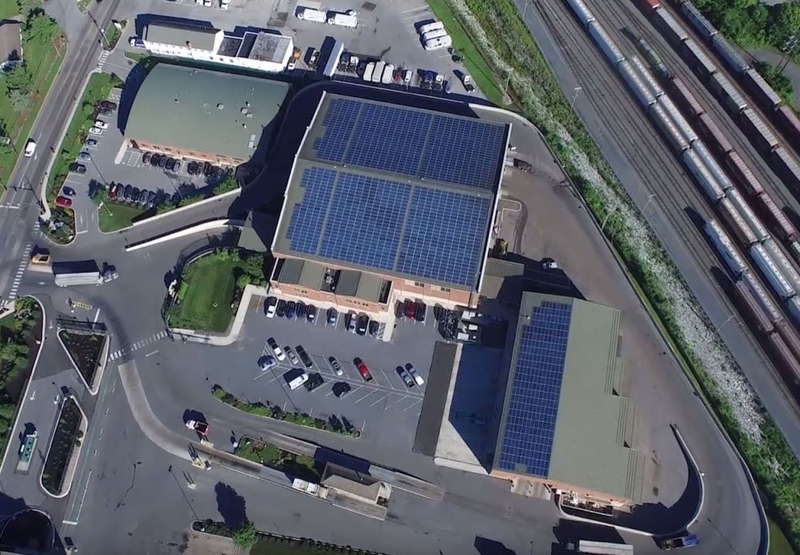 2,000 solar panels on four buildings at the Transfer Station Complex. Generates 434 megawatt hours of electricity each year. Provides 80% of the TSC's annula electric needs. In order to reduce the environmental impacts of our waste transfer operations, stabilize long-term fuel costs, support the Pennsylvania-based natural gas industry and build a cleaner, more sustainable future, LCSWMA replaced our previous diesel-powered transfer fleet with trucks powered by compressed natural gas (CNG). LCSWMA’s fleet is comprised of 16 transfer tractors and two dump trucks, which transfer waste between our four facilities. The CNG trucks are powerful enough to haul a substantial payload, while operating cleanly and quietly. 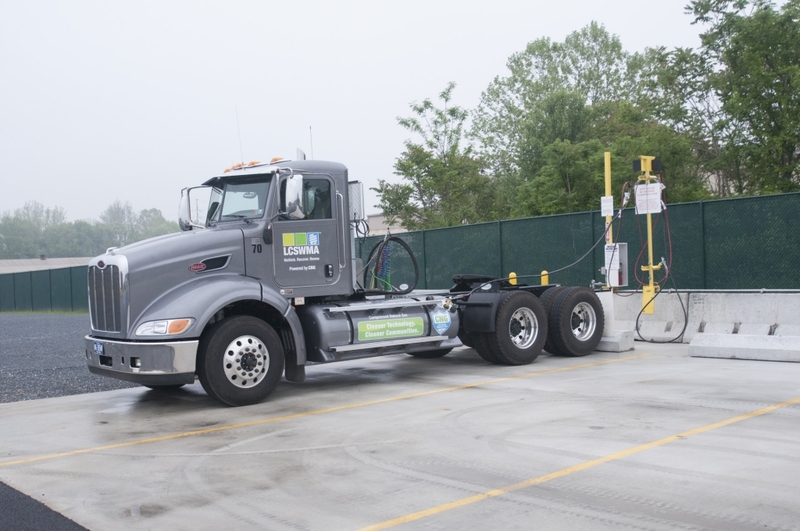 While LCSWMA utilizes a time-fill (overnight) fueling system for our fleet, the CNG project also includes a fast-fill fueling system for waste haulers and other select fleets. This is the first duel-fueling system of its kind in Lancaster County. This project reduces over 10 million pounds of air pollutants each year in Lancaster County; in addition to eliminating the 140,000 gallons of diesel fuel LCSWMA previously used each year to power the fleet. 94,000 GGEs (gasoline gallon equivalent) of CNG sold to outside fleets in 2017. 219,000 GGEs of CNG consumed by LCSWMA’s fleet in 2017. This project reduces over 10 million pounds of air pollutants each year.